After surviving the deathly combination of midterms, assignments, and group projects for the semester, I finally had a few moments of spare time. I really wanted to have a vacation to reward myself for my hard work, but because I still had classes to attend and finals to prepare for, I decided to "vacation" at Sushi Paradise. The restaurant donned ocean-themed decorations and played exotic ukulele music. What more could I ask for? 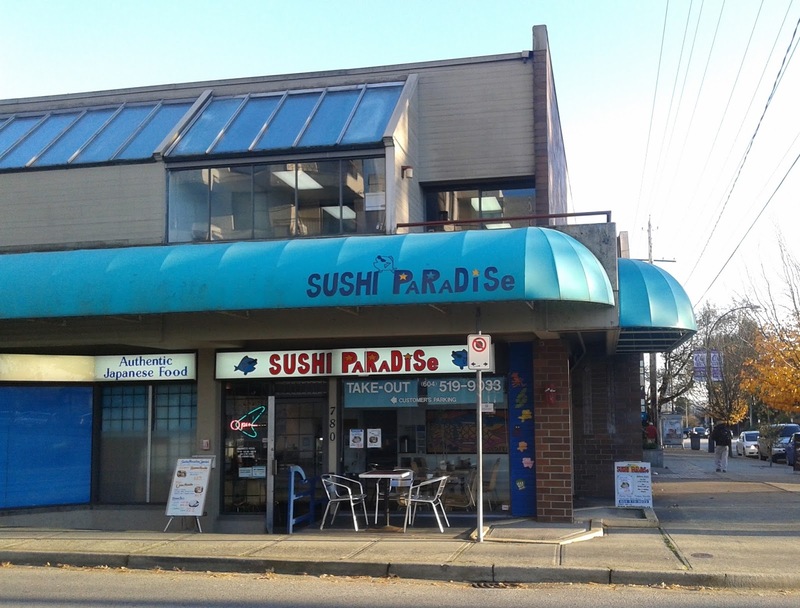 Sushi Paradise is Japanese-operated and focuses on takeout, though they do have a few tables inside. You order and pay at the front, but there is a server who brings the food to your table. One unique feature of their menu is that you can order mini versions of their Teriyaki Donburi and Udon dishes, which is perfect for people like me who like try as many dishes as possible. All of my food came out almost simultaneously. I wasn't especially hungry, so I didn't order a lot of food this time. The Paradise Roll, at $6.98, was the most expensive roll on the menu, and going by the logic that expensive things should be better, I decided to order it. It consisted of tuna, salmon, unagi, tamago, inari, fish roe, and vegetables. The individual ingredients were well-executed. 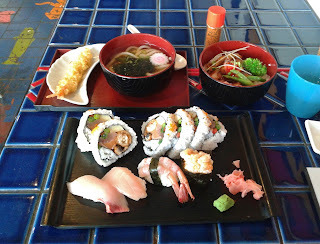 In particular, the tamago was soft and fluffy, while the unagi had a tasty smoky flavour. I found it interesting how the inari had rice inside it - it was like having a piece of nigiri inside a sushi roll! Some of the ingredients got lost in the mix, but as a whole, the roll tasted decent. 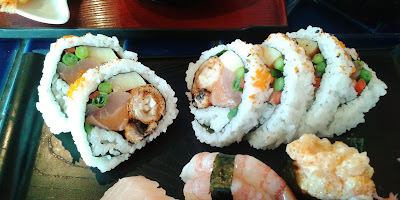 The Hamachi Nigiri had a light flavour and a smooth texture. 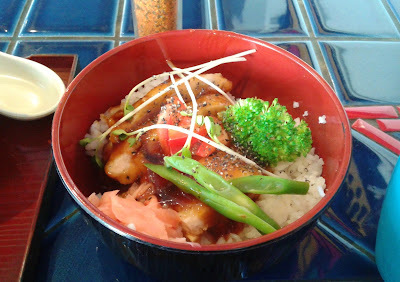 It was not outstanding, and I thought that the sushi rice could have more flavour. 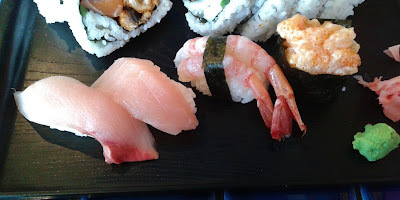 The Toro Nigiri was sliced too thin, so it was lacking in flavour and did not exhibit a melty texture. However, the Amaebi Nigiri was excellent. The sushi rice was packed correctly, and the amaebi tasted like fresh spot prawns melting in my mouth. The Chop² Nigiri, which was essentially Chopped Scallop Nigiri, came with fresh, creamy scallop and was wrapped with a slightly crispy piece of seaweed. Next, I had the Mini Tempura Udon, and for $4.98, it was a fair deal. 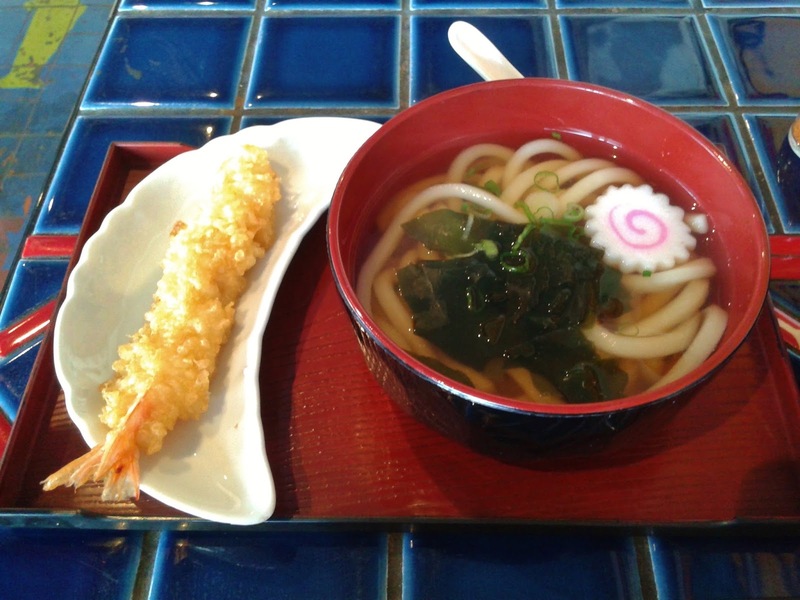 The udon noodles were on the softer side, and the broth was quite standard fare. Unfortunately, the tempura prawn that came with the udon was poorly executed, as the batter was hard on one side and soft and soggy on the other. Did they accidentally drop it into the udon broth and then pull it back out? After one bite, I just dunked the rest of the tempura into the broth so that it would at least be consistently soggy. I found the Mini Chicken Don ($4.28) to be more filling than the udon. It was also executed better and came with fresh, tender chicken and well-cooked rice. The colourful assortment of green beans, bell pepper, daikon, and ginger made the donburi more visually appealing. The only issue I had was that the thick consistency of the teriyaki sauce made the chicken and the rice taste mushy (even though they were not in fact mushy). The staff at Sushi Paradise were quite friendly, and most of the sushi items were decent. After all, it's Sushi Paradise and not Udon and Donburi Paradise. The restaurant's location behind Royal City Centre in New Westminster makes it hard to find, and this is further complicated by New Westminster's insanely confusing street-naming system. I managed to get off at the right bus stop, but it took me almost fifteen minutes to locate the restaurant because I kept mixing the diagonal streets and avenues up. At the very least, I got my exercise for the week. "The restaurant donned ocean-themed decorations and played exotic ukulele music. What more could I ask for?" Your description of Sushi Paradise is too accurate LOL! What more can one ask for?!! Thanks Selina! There are still 2 weeks before my last final, so I hope I can survive until then. LOL I was quite surprised at how hard they tried to be like an exotic paradise!